So the other night, my marketing and management courses collided in yet another “Aha! So that’s how they work together!” moment. Who knew that brand strategy and HR are destined to get married and have beautiful babies? Let me explain. Adam Kleinberg recently took time out from his busy schedule as CEO/Founder of Traction to talk to my services marketing class about people strategy. Our instructor, Neil Cohen, is driving home the point that successful brands focus on “one thing.” Your brand can’t be all things to all people; you have to do one thing and own it. Every aspect of the business needs to support that one thing. And the one thing might not always be what you first think it is. If you want to be a great customer experience company, you have to be a great employee experience company. Yes. Just breathe that in for a second . . . okay. Your internal brand is just as important as your external brand. Feels good to say that, doesn’t it? Maybe from the perspective of an employee? Zappos answered those questions by “owning” customer service and implementing an incredibly unique hiring process that weeds people out by offering them money to leave. Who stays? People who are passionate about customer service and the somewhat zany Zappos brand. Traction puts these values into practice on a daily basis, creating a cultural framework that empowers employees to make decisions that fulfill the agency’s brand promise and meet clients’ needs. Oh — and no request for time off to go to Burning Man ever gets denied at Traction. Hey, if you want buy-in from a creative, bleeding-edge group of people that’s ready to own the intersection of psychology and technology, you meet their needs wherever they are. And in return, they meet the needs of your clients. And then, I saw the photo above this post posted by a friend on Facebook and I thought, “Well obviously I have to write about this now.” Isn’t it nuts how nicely that jibes with what I’m talking about? Your brand has to shine both inward and outward, and if you focus on your internal brand, you’re going to shine for your customers. So we learn these theories behind branding in our marketing courses, and study organizational culture for management exams, and if we’re lucky, we get enlightened about the connection between the two by an awesome guest speaker in a great services marketing class. But do we put them into practice? It seems like once people get out in the real world, they either get jaded by the rigors of the day-to-day, or they get browbeaten into submission by the keepers of the status quo. Traction and Zappos seem to be exceptions to the rule. I don’t know about you, but I want to change that. Or *are* these great brands exceptions to the rule? What is your experience? Does your brand own one thing, and does your people strategy support it? If not, can you imagine a difference if your brand were to step back and try? Sean McGinnis and I were talking about the fact that good leaders are both good thought leaders and good people leaders. The topic seems in alignment with yours. I think Traction and Zappos are exceptions, but they don’t have to be. 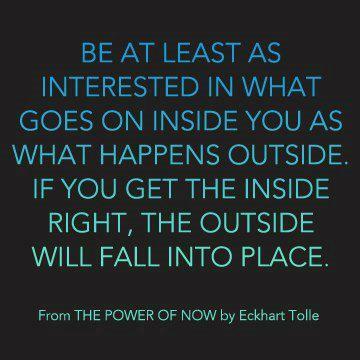 I believe wholeheartedly that what’s in the inside affects the outside and often is transmitted to the outside. Companies can whitewash the exteriors, but you won’t find many happy employees inside the building. Long-lasting change has to start on the inside. I hope that my company will grow large enough so that I’ll have to hire people. If that comes to be, I know I’ll focus a lot on internal culture and communication. It’s important to me not only as a communicator, but also as a person who’s worked in places where the culture and communication is lacking. I hope your company grows too, because I think you will be a phenomenal leader. I see reading holidays for your team! Excellent points, there… and unhappy or bored employees are not going to do the work necessary to win any brand loyalists. They’re not going to have the energy to innovate or “surprise and delight” anyone. It just makes so much sense to make the effort to design a good people strategy, doesn’t it?